This was a first for me. So after last night's blogpost on Google's Android Developer Console April Fool's hoax, ForTechiesOnly.com experienced a traffic spike. That blogpost was the most viewed post i have had in 4 years (largely thanks to HackerNews traffic, since i posted a link to the post there late last night). So of course i couldn't help but check out my Google Analytics through out the day, to see how the traffic spike is tapering off. 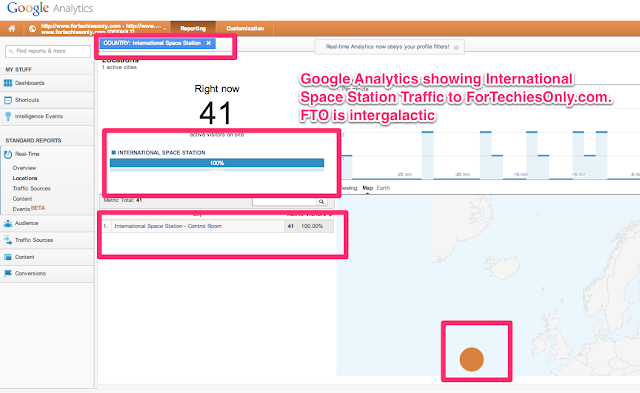 One of my favorite features for Google Analytics is the "Real Time Analytics" view. Where you can see how many users are hitting your site on a minute by minute basis. If you haven't seen this view, you are missing out. So i was shocked to see that in the Real Time View, i currently had 41 visits from a local i normally dont get traffic from (on the map it showed a dot over the Caribbean). When i looked closer, it showed me that the visits where originating from the "International Space Station Control Room". The dot of the locale would refresh every minute or so and slowly move across the map of the world. 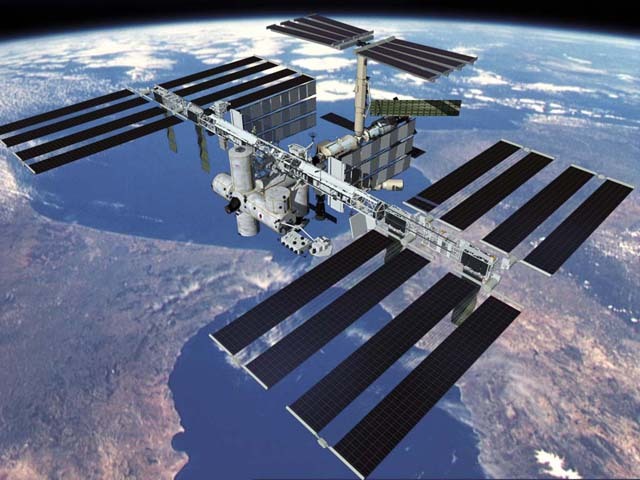 let me repeat that THE INTERNATIONAL SPACE STATION WAS LOOKING AT MY BLOG. WOW !!!!! ForTechiesOnly.com just went INTERGALACTIC !!! Then i started thinking, how the hell are there 41 people inside the ISS? And why would they all be checking out my blog after the traffic spike from hackernews mostly tapered off. Then it hit me, this was yet another Google April Fool's hoax. A subtle and unpublicized one (or at least i didnt read about it anywhere). Google really went all out this year for April 1st, 2013. They had at least 6 hoaxes i saw, and probably a few other ones that will surface before the calendar date changes. Yes, it is a great opportunity and the international space station is working for technology which is very essential for me as well. Keep it up. I must follow the discussion which is very useful to me as well. Keep it up. Thanks for your marvelous posting! I quite enjoyed reading it, you happen to be a great author. I will remember to bookmark your blog and will eventually come back very soon. Go to best social plan for get more related articles. Have a nice evening!